Malaysia is the 3rd largest economy in Southeast Asia. GDP growth has been strong, with 2018 growth rate forecasted to come in at 5.4%. According to the Nielsen Global Survey of Automotive Demand, Malaysia boasts the 3rd highest level of car ownership globally and the highest incidence of multiple car ownership globally, where 93% of Malaysian households own and utilise at least 1 car, turning to single-occupant personal vehicles as a dominant mode of transportation. This is a drastic increase from 2014 where 54% of Malaysian households owned more than one car. The Nielsen study also revealed that culture interestingly plays a role in car ownership, where 62% of Malaysians saw the ownership of cars as status symbols. The numbers of cars are forecasted to increase. 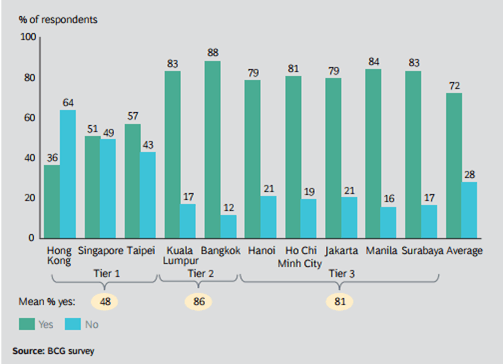 In the 2017 BCG survey - ‘Unlocking Cities’- shown in the figure below, the percentage of respondents who intend to buy a car in the next 5 years is high at 83% in KL. The expected continuous rise in population growth, urbanisation and increases to the car population is also bound to cause more congestion especially in highly dense urban cities like KL where the majority choose to travel by car. The effects of road congestion are plenty. The World Bank estimated that road congestion in and around Kuala Lumpur reduced Malaysia’s 2014 gross domestic product by between 1.1 per cent and 2.2 per cent. 158 hours per year is also wasted by a single commuter on traffic, according to the traffic congestion statistics for Kuala Lumpur based on TomTom’s 2016 data. The dense population in urban areas worsens the congestion by increasing levels of environmental degradation and reducing the efficiency and convenience of public transport services. Flash floods, waste disposal, stress-related diseases, increased occurrences of flooding and landslides emerge out of the congestion that Malaysia faces on a daily basis. Additionally, the percentage of road accident per vehicle on road has increased from 60% in 2008 to 66.5% in 2017. Road congestion, however, is a pertinent issue that all developing and developed nations are facing today. For instance, in India, traffic congestion during peak hours in cities costs about US$110,000 per annum, pushing the Modi government to develop a fully integrated public transport system and to discover the potential of emerging technologies such as Smart parking. In March 2018, Maharashtra adapted a new Urban bus scheme incorporating automated announcements, fare collection systems and an online network that manages vehicles and stocks to increase the efficiency of transport systems. Digitalisation can have a profound impact on transportation services and might provide an avenue to relieve jams and congestion. Utilising the latest ICT solutions can ease vehicle to vehicle information coordination and the integration of multiple technologies can improve operational efficiency and increase passenger satisfaction. According to the World Bank, it is forecasted that if Malaysia is successful in initiating a 25% shift from private to public transportation, congestion can be alleviated entirely. Malaysia’s Smart Cities Initiatives was introduced during the 11th Malaysia Plan (2016-2020). It reaffirms the Government’s commitment to the wellbeing of its rakyat by including critical segments of the government’s plan such as the pursuit of “green growth for sustainability and resilience” and “Malaysia beyond 2020”. Since then, Malaysia has started deploying an intelligent Internet of Things (IoT) network in cities such as Kuala Lumpur, Iskandar Malaysia, Smart Selangor and Putrajaya Smart City that incorporated IoT, Cloud Computing, big data analytics and spatial geographic information integration in order to promote smart city planning, construction, management and services. With smart mobility being one of the key aspects of its Smart Cities definition, Malaysia also launched its Intelligent Transport System Blueprint 2017-2022 as part of the government’s efforts to upgrade its current transportation system, with big data analytics forming the core of the system. Data gathered from ICT infrastructure is analysed to gain insights and gives alternative choices for more efficient operations. Support systems such as mobile apps will help consumers make more informed transportation choices. Since 2016, tests have been carried out to facilitate the implementation of a smart traffic management system in Cyberjaya, the silicon valley equivalent for Malaysia, to monitor and optimize traffic control. Held in collaboration with a subsidiary of Telekom Malaysia Berhad, the test comprised of IoT networks, cameras with analytics capabilities and a central traffic management command centre. The blueprint for 2017-2022 will guide the continued implementation and improvements of these systems in other states. In 2018, the Malaysia City Brain project was launched. This was a partnership between Malaysian Digital Economy Corporation (MDEC), Kuala Lumpur City Hall, Alibaba and others to optimise traffic and parking and better facilitate energy management. The urgency of the project was perhaps best revealed in the 2015 World Bank report that estimated about 5 million people get stuck in the Klang Valley traffic every day. Enabling innovation in mainly three aspects; mobility, public safety and sustainability, the City Brain technology was first used in Hangzhou, China. It has since increased the traffic efficiency by 15%, achieving an average per vehicle savings of 3 minutes on traffic. City Brain’s ability in predicting traffic flow, detecting accidents and providing instant feedback has resulted in significant decrease in congestion. In China’s List of ‘The Worst Congested cities’, Hangzhou landed at 57th position from previously being the 5th. The sophistication of the cloud technology is proven in its ability to predict the number of cars on road instantly. Not only did City Brain shortened commutes, in the case of medical emergencies, it is also able to change traffic lights and make the way clear for ambulances and fire trucks such that they can head to their destinations 49% faster. The City Brain project is able to do so by gathering digital data via videos from intersection cameras and GPS Data on the location of cars and business, and uses that data to impressively coordinate more than a 1000 road signals. The Malaysia City Brain project sets precedence to the potential amalgamation of 5G, IoT and AI (Artificial Intelligence) in the future traffic network. This could regulate billions of connected devices — cars, street lights, cameras, utilities, buildings — to communicate at speeds 10 to 100 times faster than today with ultra-ultra-low latency and massive capacity. When completed, the project will include an ecosystem of businesses, private organisations and government agencies installing the use of large-scale computing engines, Asparam to optimise traffic flow and generate structured summaries of data, such as traffic volume and speed in particular lanes. In addition to Malaysia City Brain, MDEC signed a Memorandum of Understanding (MOU) with ride-hailing company Grab. Grab was previously involved with the Malaysia SEA games Organising Committee (MASOC) during the 2017 SEA Games to successfully mitigate traffic congestion. Under this new partnership, Grab’s real-time anonymised traffic data for popular KL routes will be shared from Grabs GPS data streams to Malaysia’s traffic management agencies and city planners. The partnership is important as according to the Moving SEA Together report, Grab influences the travel decisions of 2.5 million Southeast Asians daily. As Malaysia and Southeast Asia’s largest transport network, it is a key source for efficient and accurate data that represents real drivers and city dwellers in everyday conditions. Digitalisation comes with its own share of challenges. As Malaysia continues to digitalise its transport operations with range of information flowing across systems that track and monitor both digital and physical networks, the risk of cyber-attack is elevated. As more devices and control systems are connected online, more vulnerabilities will appear, increasing the potential for disruption to physical assets and causing significant damage to infrastructure should there be an attack or misuse of hacked information. A comprehensive proactive strategy should continue developing in tandem with digital advancements. It is also crucial that the government regulates competition in the digital realm. It is common for new products to be launched almost everyday and as such resources ought to be well-managed and sunset or infant industries to be protected. As cities compete globally for talent and investment, smart cities will be an indispensable catalyst for unprecedented economic growth. You can be part of the discussions by sharing your thoughts with key stakeholders and gain further insights on Smart Cities in Malaysia at Asia IoT Business Platform 2019. Drop us a note at info@industry-platform.com or learn more at www.iotbusiness-platform.com/register to be part of the enterprise digital transformation conversation in ASEAN.